徐友祥, 王韶华, 张书志, 方伟, 冷培恩. 糖醋诱饵不同重量组监测蝇类的效果分析[J]. 中国媒介生物学及控制杂志, 2017, 28(6): 564-566. XU You-xiang, WANG Shao-hua, ZHANG Shu-zhi, FANG Wei, LENG Pei-en. 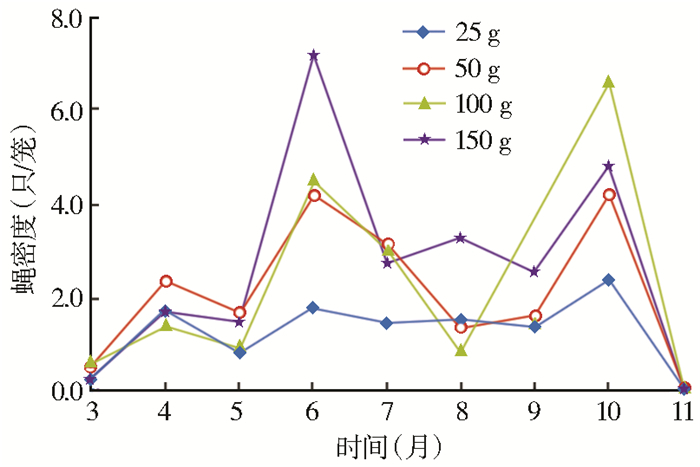 Effect analysis of fly monitoring by sweet and sour bait at different weights[J]. Chin J Vector Biol & Control, 2017, 28(6): 564-566. Abstract: Objective To explore the effect of different weight groups of sugar and vinegar bait to monitor fly density and provide scientific basis for control of flies. 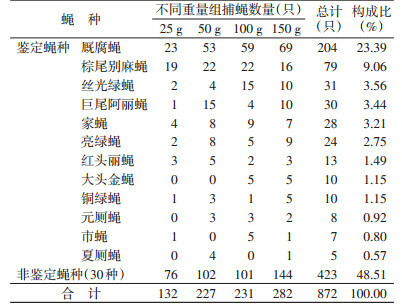 Methods During March-November 2015, the author selected 4 habitats of Jiading Park, residential area, restaurant and farmer's market were selected, trapping was conducted by fly cage, fly density was calculated and analyzed using Excel 2003 and SPSS 13.0 software to test the density of flies in different weight groups by means of rank and test. Results Five families of flies were captured, which belonged to 25 genera and 42 species. Twelve species of flies were identified by national vector surveillance program (Trial Implementation), accounting for 51.49% of the total catch. The predominant species consisted of Mascina stabulans, Boettcherisca peregrina, Lucilia sericata, Aldrichina grahami, Musca domestica, and L. illustris. The density of flies increased with the increase of bait weight, and the difference was statistically significant (HC=9.188, P < 0.05). Flies began to appear in March and disappeared in November. The seasonality showed peaks in June and October. The highest density of flies was observed after 1 d of sweet and sour bait. Conclusion The species, density, distribution and seasonal dynamics of flies were obtained by using sweet-sour bait to monitor flies. 中华人民共和国卫生部. 全国病媒生物监测方案(试行)[S]. 北京: 中国疾病预防控制中心, 2005. 中华人民共和国国家质量监督检验检疫总局, 中国国家标准化管理委员会. GB/T 23796-2009病媒生物密度监测方法蝇类[S]. 北京: 中国标准出版社, 2009. 范滋德. 中国常见蝇类检索表 [M]. 2版. 北京: 科学出版社, 1992, 5. 冷培恩, 徐仁权, 朱仁义. 蝇类密度监测方法的现状[J]. 寄生虫与医学昆虫学报, 2005, 12(3): 189-192. 潘引君, 潘俊锋, 谢玲丽, 等. 上海市青浦区媒介生物现状调查分析[J]. 中国媒介生物学及控制杂志, 2008, 19(6): 537-539. 王飞, 张富强, 颜传均, 等. 2006-2010年上海市虹口区蝇类监测结果分析[J]. 中国媒介生物学及控制杂志, 2011, 22(5): 480-483.